CAMremote-3w is used to remote control all cameras* which have built in Wifi remote control support. It will create wireless bridge between CAMremote and camera so that remote control devices (like hobby radios etc) which are connected to CAMremote can control the camera. Common controllable features are AF, Shutter release, Movie recording, Zoom, settings of camera parameters etc but depends of specific camera capabilities (commonly same features which are available in camera’s smartphone apps). Wifi transmitter is using very low power to emit radio signals so device should be attached close to camera (20 meters range). Note it doesn’t support liveview streaming feature so Wifi link is not generating heavy traffic in 2.4GHz frequency band thus not generating interference to other radios at same frequency band. Device size is 36x23mm, weight 6g. See example configuration. Configuration can be done using PC configuration software. Smartphone’s application is coming! Standard set of CAMremote contains the CAMremote-3w Controller with integrated Wifi, CR-PC USB Configuration Cable (USB A-type, 70cm/27.6″ or 13cm/5.1″) and 3 JR/Futaba-style Cables (with 3-pin female terminals, length 15cm/5.9″ – 2g/cable). 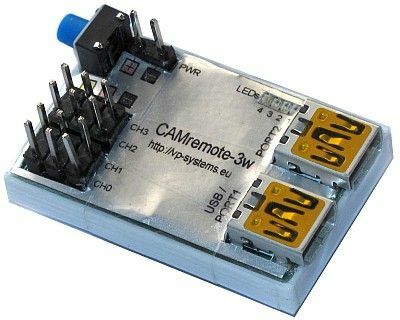 Note – CAMremote-3w is supporting wired connections as well. 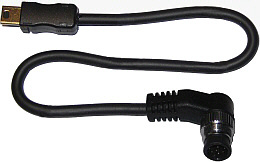 Standard Set does NOT contain cable for camera control, choose suitable cable below. Enter camera model(s) to ‘Cameras’ field if you would like to have pre-configured setup.